My eighteenth ground of 2016 was on Tuesday 4th October at Hardenhuish Park in Chippenham, Wiltshire. 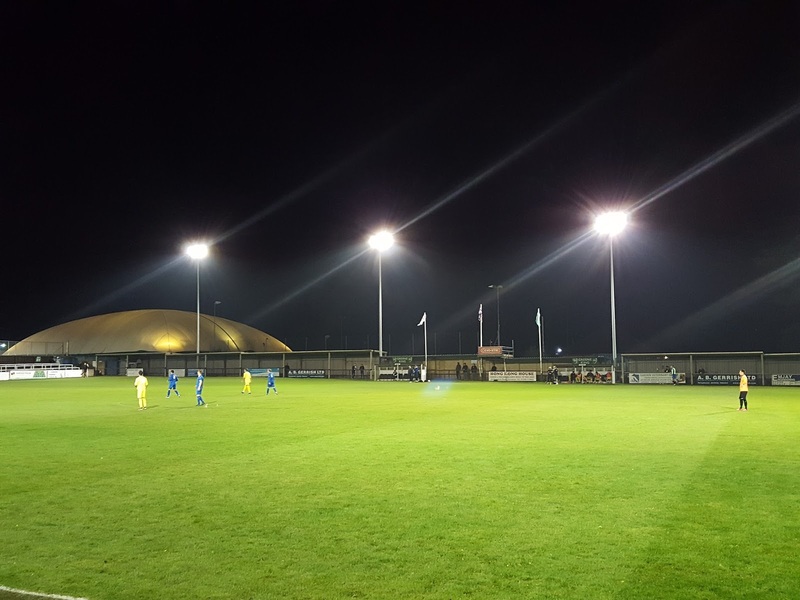 The match was Chippenham Park vs. Bishop Sutton in the Western League Division One. Hardenhuish Park football ground forms part of a sports complex which takes up part of Hardenhuish Park itself in the north of the town. The football club's neighbours include the town's cricket club, tennis club, bowls club and hockey club. Just over half a mile from Chippenham railway station the venue has been home to Chippenham Town since 1919. In 2012 the club formed Chippenham Park FC who reside at the same venue. The entrance to Hardenhuish Park is in the south-east corner of the ground and you are immediately greeted by two demountables either side of the entrance - one of these is a food outlet with the other a VIP and sponsors lounge which is adjacent to the eastern stand behind the goal. 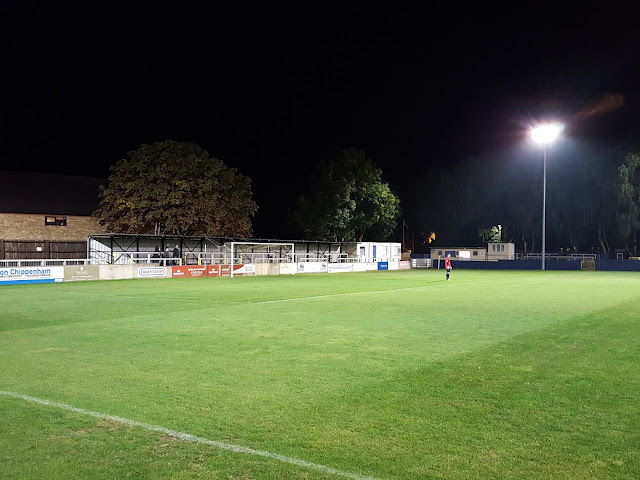 As you work your way from east to west there are 4 rows of uncovered concrete terracing and next to this an all-seater stand with around 300 seats. This structure consists of the main stand area in the middle which includes the dressing rooms and a club bar at the top. Either side of this are areas of seating which appear to have been added onto this stand at a later date. To the south of this are 3 rows of concrete terracing with 3 further demountables at the back - these house the boardroom, the club office and the club shop. The northern side of the ground has a a large flat concrete area running the length of the field with the entire of this area is covered. In front of the middle section are the two dugouts. The area behind the eastern goal is a covered metal terrace of 5 rows for most of its length with an uncovered flat section next to this. Behind the other goal there is an uncovered concrete terrace with 4 levels on the northern section before being narrowed down to 2 levels by the hockey pitch behind this end of the ground. Bishop Sutton looked more dangerous in the early going and they kept getting in behind the Chippenham Park defence to test their goalkeeper. Despite this in the 25th minute the home side took the lead against the run of play when the Bishop Sutton defence appeared to go missing. The ball was initially played down the right wing before being squared for an unmarked Lewis McCarron to slide past Chris Manns in the visitors goal. 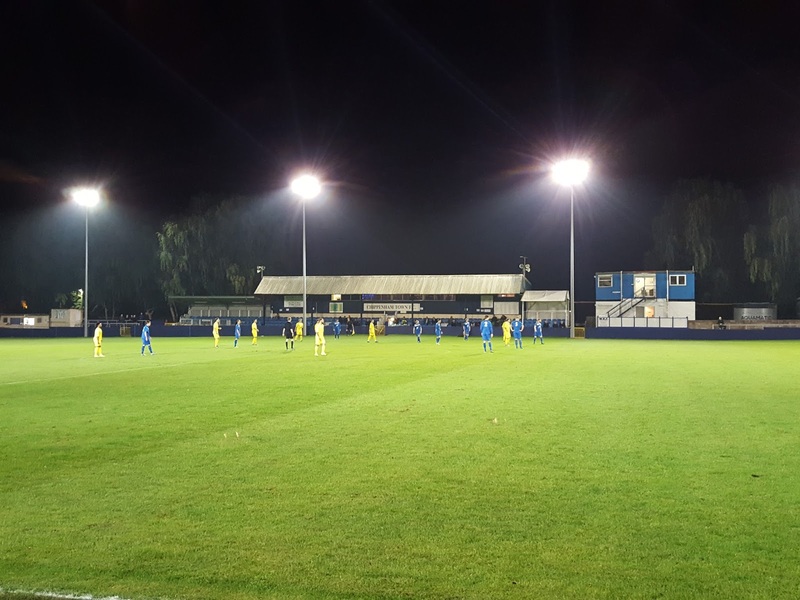 The away side thought they had equalised in the 34th minute when a corner was cleared to the edge of the box and drilled back into the net taking a deflection on the way through, However the assistant referee had raised his flag for offside and the goal was chalked off. The visitors continued to attack but were increasingly leaving gaps in their defence and had a lucky escape on the hour mark when a defence-splitting ball saw an attacker one-on-one with Manns who saved his effort. In the 81st minute Manns denied Chippenham again when McCarron's effort was saved and Ryan Bole's effort on the rebound was cleared off the line. Within a minute of this though Bishop Sutton conceded a penalty for a trip in the box. 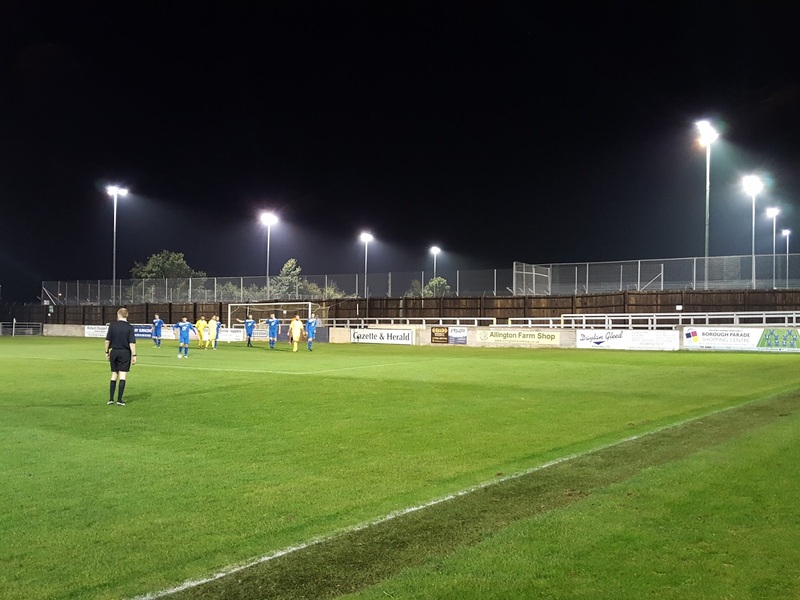 Bole was not to be stopped this time as he stroked the resulting penalty straight down the middle of the goal to wrap up a 2-0 win for Chippenham Park.